Art and Design maintains and displays our fine art collection and consults on interior design projects.The committee's principle mission is to enrich Jewish identity, spirituality, and generational continuity through the visual arts. For art management, it accepts, preserves, and displays creative works and objects that represent a wide range of Jewish themes and observances. This committee also implements renovation, cleaning, framing, and inventory of art works. The Development and Fundraising Committee oversees and coordinates all fundraising efforts within the synagogue. The dollars raised help ensure that our educational programming is affordable and that the many needs of our congregants are met. Contact Scott Gordon, Vice President of Fundraising and Development or Evan Stern, Development Director at evans@adath.net or 952.215.3916. Torah Scroll Repair: Volunteers and Hazzan Scott Buckner help maintain and repair Adath Jeshurun’s Torah scrolls. This group was trained by a sofer to do cleaning and repairs, such as sewing seams—as shown in the video below—and they have helped repair Torah Scrolls for other institutions as well. Contact Tobi Cooper if you would like to volunteer. The Human Resources Committee contributes to the integrity of the congregation by ensuring the development, implementation, and maintenance of sound employment practices. The committee acts in an advisory capacity to the President and the Board of Trustees regarding issues dealing with employment policies, practices, and procedures. Marketing & Communications supports and promotes communication vehicles designed to engage congregants and the greater community. The committee strives to create materials that are effective and measurable. Committee members, including two staff representatives, have experience in photography, usability, marketing, social media, videography, journalism, design, graphics and system development. We welcome the input of other talented individuals. 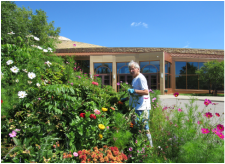 Volunteers plant and maintain the beautiful flowers in the circular garden. Church and community groups frequently visit the synagogue to learn about Judaism and Jewish life, and sometimes to experience a Shabbat service. Knowledgeable volunteers greet visitors, provide an orientation, act as hosts during the service, and answer questions afterward. The Finance Committee helps ensure our congregation’s financial well-being. Our committee is committed to operating in a fiscally responsible manner, where congregational needs are balanced against available resources. of the various programs and the congregation as a whole. The committee meets in the early months of our fiscal year, before the budgeting process begins, in order to understand the various programs supported by our budget and how they connect to our synagogue community. In early spring, staff prepares budgets for the next fiscal year, and the Finance Committee begins the hard work of collaborating with lay leaders and staff of the various departments to reconcile the proposed budgets to available funds. The Property and Catering Committee assesses and manages the changing needs and costs of our building and property, both interior and exterior. In addition, the committee ensures that Adath excels in event planning and food preparation to best meet the needs of the congregation.